This recipe was originally published on November 18, 2014 and republished on November 11, 2018 with updated content, photos and a video (located in the recipe card). Thanks for watching and sharing. Did you know that sesame seeds grow in pods on a tropical plant which probably originated in Africa? They are presently cultivated throughout Asia and when the pods burst open, these tiny seeds are revealed. They have been used in certain cultures for over 5000 years, ranging in color from white to black. So, you can well imagine that during those 5000 years, there are many recipe variations that emerged for sesame seed bars in the middle east and the Mediterranean area. In Greece, they make Pastelli; in Israel it is known as Sukariyot Soomsoom (Sesame Seed Candy); in Sicily (which was colonized by the Arabs during the IX century A.D.) it is known as cubbaita; and in beautiful Calabria, they are known as Confetto di Giuggiulena. In actual fact, they are extremely similar to the commercially sold sesame snaps. What do I need to make Sesame Seed Nougat? Sesame seeds! No surprise here. Sugar. This is what contributes to the overall crunchiness of these sesame bars. 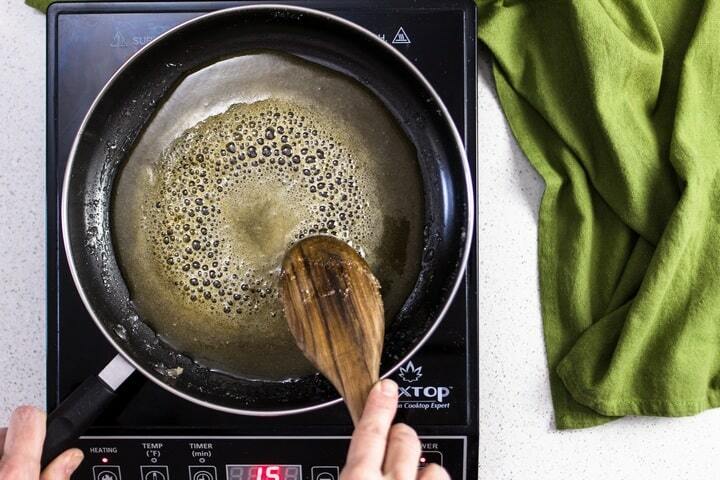 As far as accessories are concerned, we need a large non-stick pan and a wooden spoon. We also need a jelly roll pan, a rolling-pin, some parchment paper and non-stick spray. 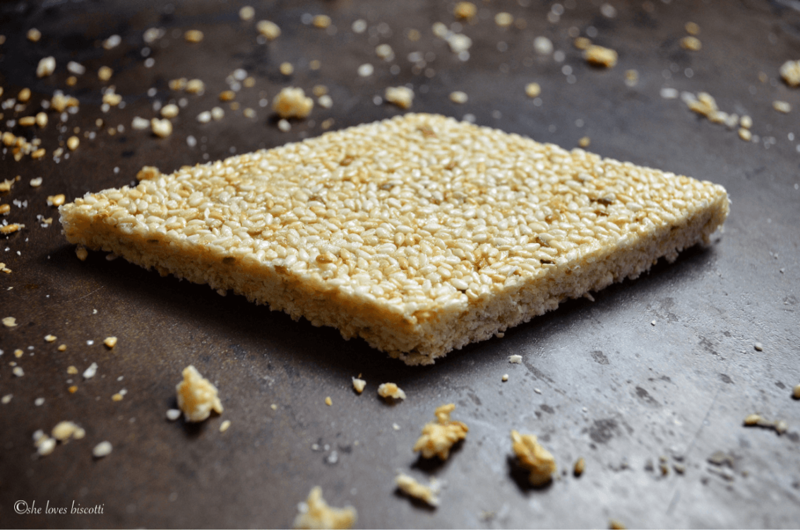 Finally, a cutting board and a sharp knife is necessary if we want uniform pieces of this sesame candy. 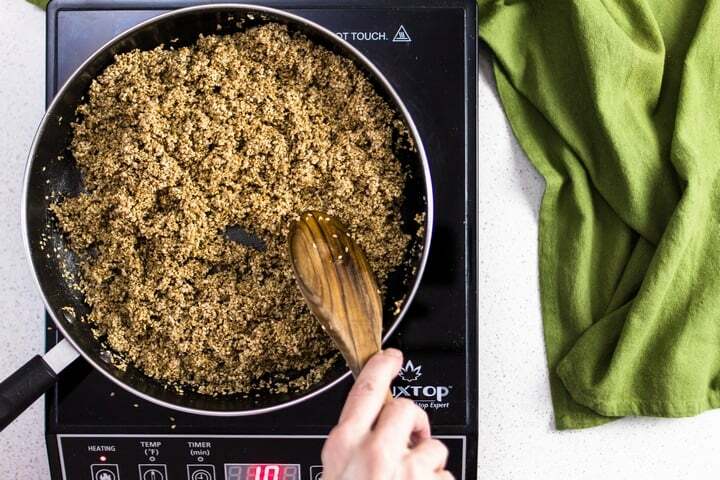 The process begins by swirling sesame seeds in a non-stick pan. 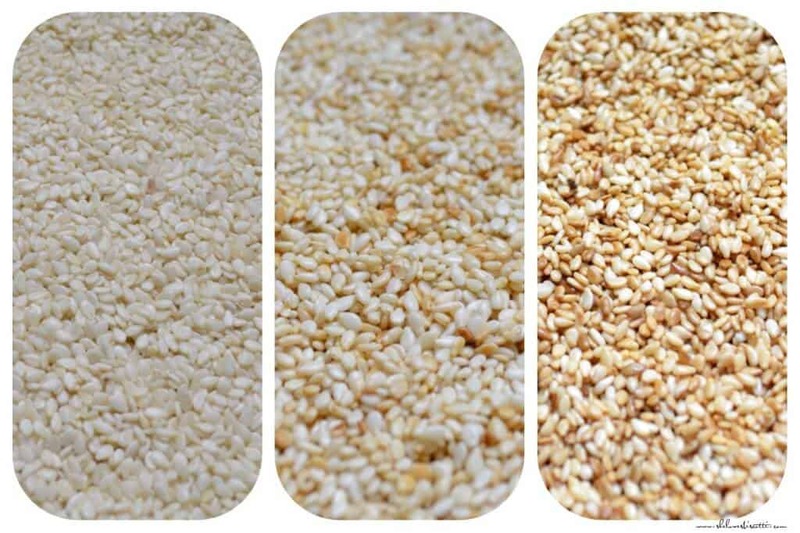 As you can see, there is a gradual change in color as the sesame seeds are toasted. As is usually the case, I am getting ahead of myself… are you ready to begin? The first thing we are going to do is toast the sesame seeds over medium heat so that they become a light golden brown. 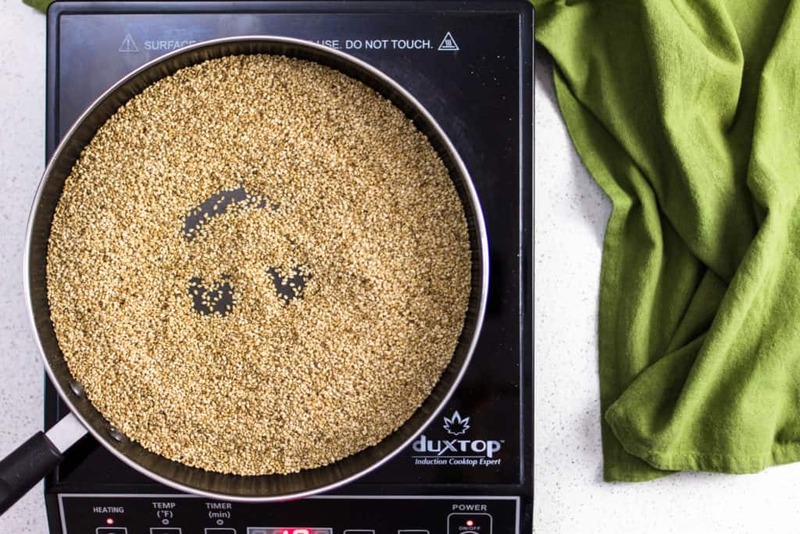 Make sure to shake the pan continuously as these seeds can easily burn. Set the toasted sesame seeds aside while we heat the honey and the sugar. On low heat, combine the sugar and the honey. Stir with a wooden spoon until properly combined. After a few minutes, the mixture will darken. When it does, it is time to add the sesame seeds. Quickly combine the sesame seeds with the honey and the sugar. Transfer this hot mixture to a jelly roll pan that has been lined with a lightly greased parchment paper. 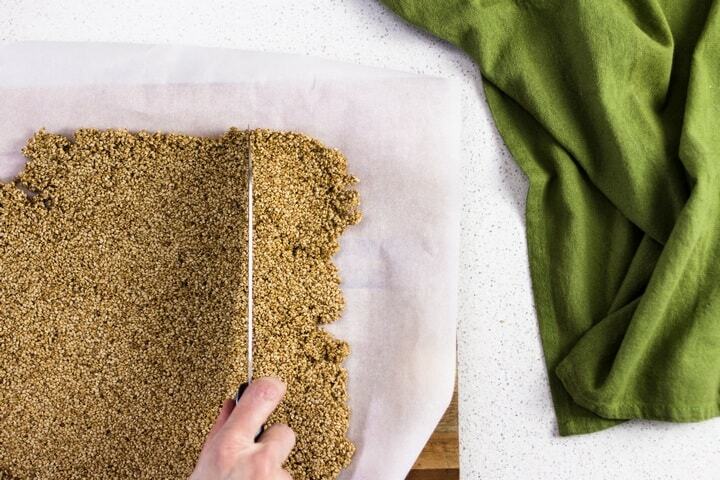 Place another sheet of parchment paper (also lightly greased) over the top and with a rolling pin, even out the sesame seed mixture. Please note that you can roll this mixture as thin or as thick as you like. I then like to rub the top of the mixture with half a lemon to give it a wonderful citrus flavor. Working very quickly, grab your knife and start cutting into the sesame seed nougat. You can also wait a few more minutes until completely hard and then just break off the pieces. Prepare the parchment paper, jelly roll and rolling-pin before starting this recipe as once the mixture comes together, it hardens very quickly and it will be impossible to roll out thinly. 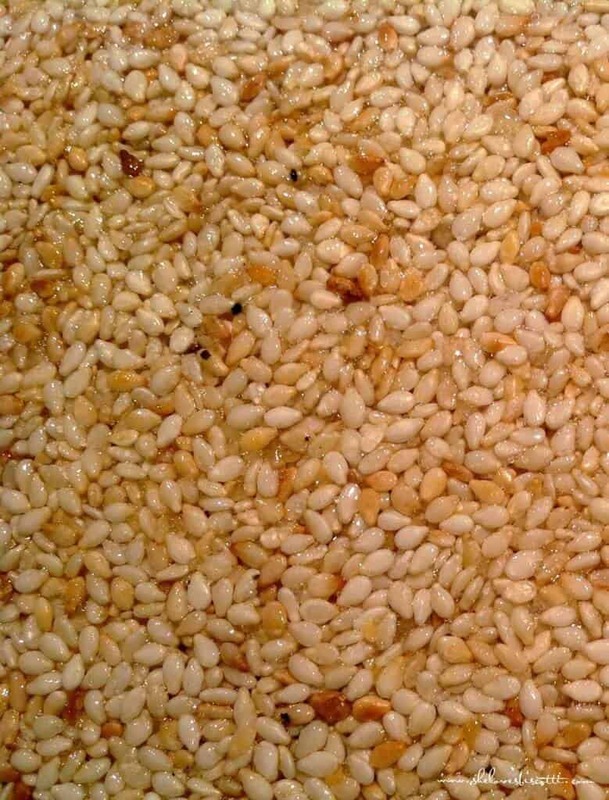 When toasting the sesame seeds, shake the pan continuously as the seeds can burn very easily. A handful of almond slivers or blanched almonds can be added to the mixture. How to eat sesame seeds? They can be used whole in baking and in savory dishes; when the seeds are pressed, they make a rich sesame seed oil which is great in stir fries. You can also grind them to get a thick ground paste which is used to make tahini. A few years ago, I was visiting my daughter-in-law’s parents during the holiday season. That’s when I first became acquainted with a homemade version of sesame snaps. They have since become a part of my Christmas cookie platter. Nancy and her husband are from Isca Marina, located in the province of Catanzaro in the beautiful region of Calabria, and this sesame candy is referred to as Confetto di Giuggiulena. Thank-you Nancy for sharing this wonderful recipe. 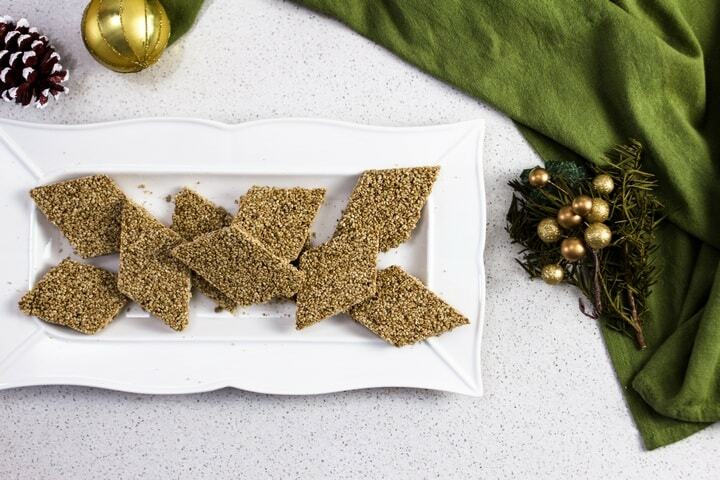 Perhaps this Calabrian recipe for this Sesame Seed candy will be part of your cookie platter as well… only one way to find out! 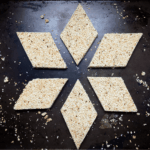 What are some of your favorite sesame seed recipes? Would love to hear about them! 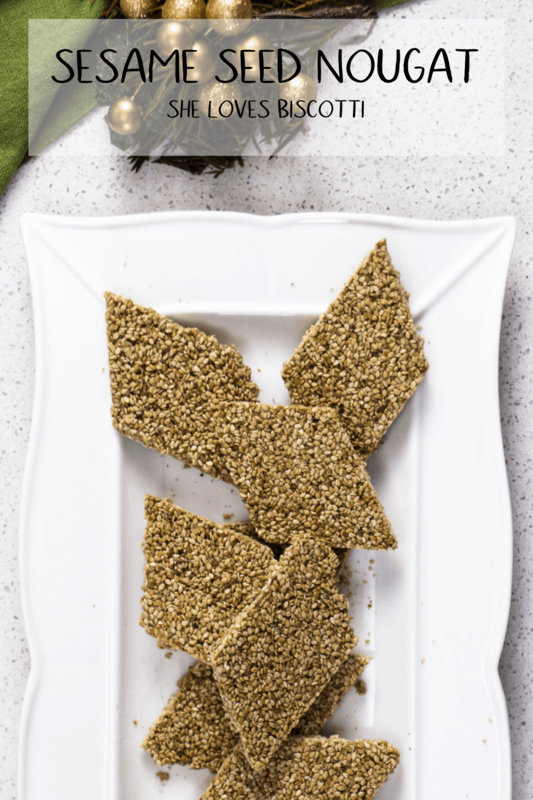 ★★★★★ If you have made this Sesame Seed Nougat recipe, I would love to hear about it in the comments below and be sure to rate the recipe! Sesame seeds, honey and sugar. Those are the three ingredients you will need to make this simple recipe called Sesame Seed Nougat. Prepare a jelly roll pan, 2 sheets of parchment paper(lightly greased with non-stick spray) and a rolling pin. Toast sesame seeds in a non-stick pan over medium heat until light golden brown. This can take about 5 minutes. Keep shaking the pan to and fro as they toast very easily. Remove from heat, place in bowl. Set aside. 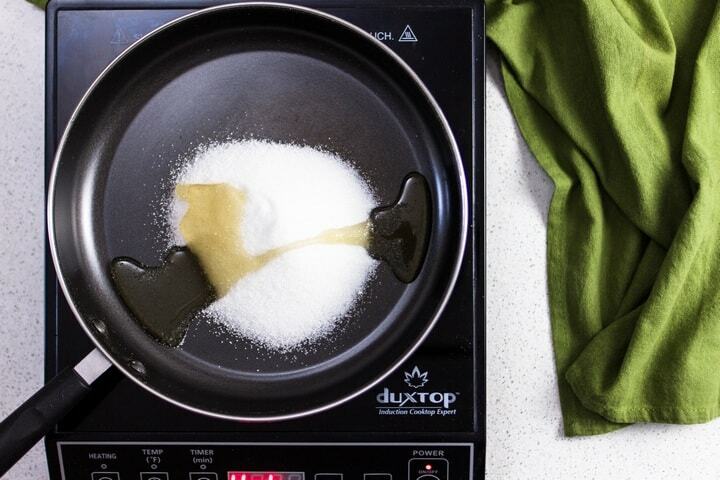 Add sugar and honey in non-stick pan and stir until sugar has melted and begins to boil. Stir continuously until mixture begins to darken (2-3 minutes). Add roasted sesame seeds and combine. Quickly turn out mixture in a parchment lined jelly roll pan. Top with sheet of parchment paper (Be careful not to touch the mixture as it is very hot). With a rolling pin, flatten mixture to approximately 1/4 inch (or whatever thickness your prefer). Cut immediately into squares or diamonds as mixture gets hard as it cools down. Will keep in an airtight container (at room temperature) for up to 2 weeks. Variations in the quantity of sugar and honey used will provide a hard crunchy nougat or a soft chewy nougat. Once you have flattened your nougat, you can rub a lemon or orange over the top- this will provide a lovely citrus scent. IF YOU ENJOYED THIS SESAME SEED POST, SAVE IT FOR LATER. PIN IT TO YOUR COOKIE BOARD! 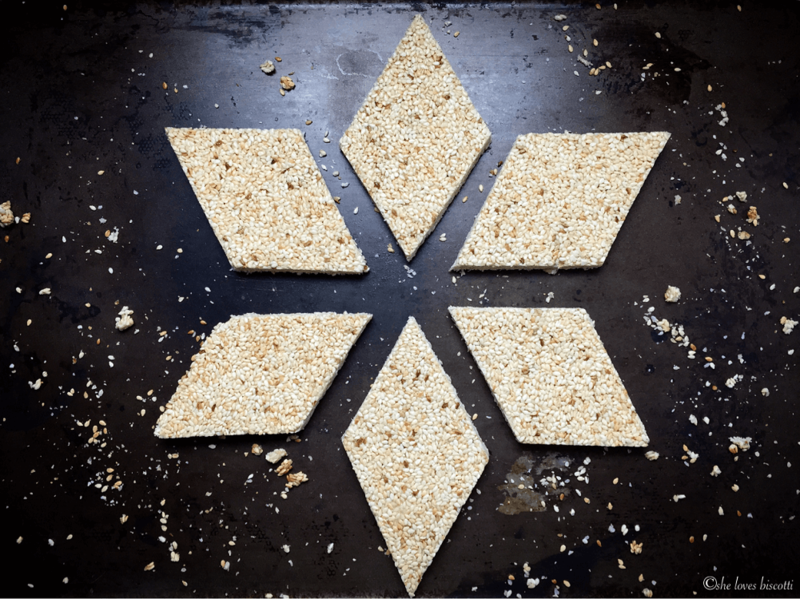 I always loved those sesame snacks as a kid, so it would be awesome to make my own! Yum! Hello Maria, I just wanted to let you know that I made this Sesame Seed Nougat to include in my Christmas cookie basket. It was so delicious that I added the recipe to my website. I made sure to give you full credit and link back. Your post and instructions were very clear and easy to follow. Beautiful photo BTW. I hope our holiday season is a good one. I just want to thank you for such a beautiful recipe. If you have a moment to see my post, here’s the link: https://www.thefinercookie.com/recipe/sesame-seed-nougat/. Hi Kim! I absolutely Love your post. I truly feel honoured. Thank-you for sharing this wonderful family recipe. You’ve captured it…perfection!